Princessly Polished: Leapyear Giveaway! Win a Timeless Trends Calendar! Leapyear Giveaway! 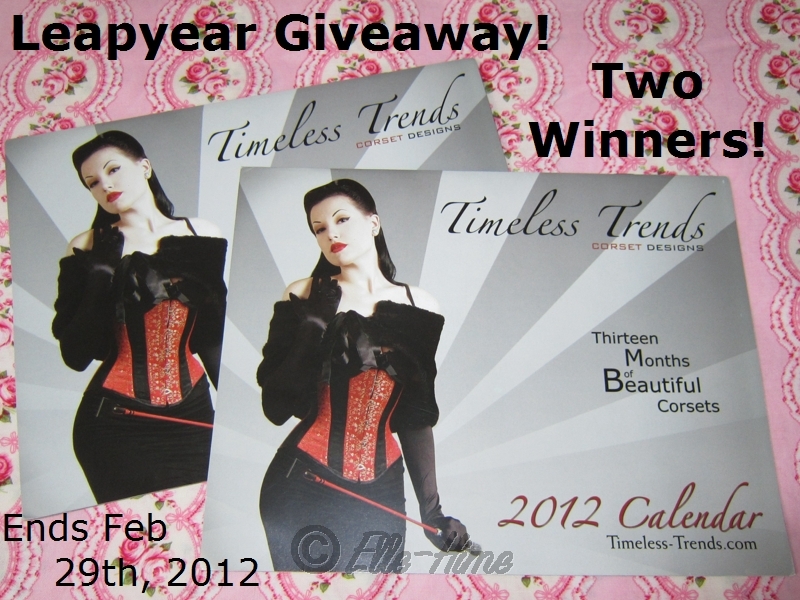 Win a Timeless Trends Calendar! What's cooler than February having 29 days? How about a giveaway ending on that 29th day? And what if that giveaway had two winners? And the giveaway prizes were Thirteen Months of Beautiful Corsets calendars? Well, I gotta say that would be pretty cool, and fortunately I am indeed hosting this giveaway so you won't be really disappointed in my opening statements! These calenders are very nice, with lots of room to write on the days and very good photography. Quite a variety of photos that are artfully done. After the year is over these are perfect for cutting up for inspiration boards or maybe even displaying as small posters! I'm not going to show every picture from this calendar, but I do want to share my favorite with you all! This is Ms. January (for 2013) - probably my favorite because of those luscious petticoats and skeleton key jewelry! It's sort of funny that I ended up getting these calendars in the mail yesterday... I was thinking about how I really wanted to have a giveaway for it being a leap year; either something that would start or end on the 29th, you know. Well, how perfect is this? I'm not generally into running two giveaways at the same time but this is an exception! These calendars retail for $6.50 and you can see them on Timeless Trends here. This giveaway will be running until Feb 29th, 2012. I'm sorry but this giveaway is for United States residents only! Or, if you know someone living within the United States or US Territories I will happily mail to them! If this option creates too much trouble I may have to take it down - I doubt I will because it is working in my other giveaway! I don't want to be unfair, but this is the best solution I can come up with. And thanks to Timeless Trends for being awesome - go check them out! Aww, sorry! Well, it might be a nice prize to win anyway.